The phrase ‘life changing’ is a term I’ve probably only ever used in reference to the invention of GHDs and my discovery of Japanese food, so believe me when I say that a recent purchase is totally worthy of such a label. Now, as much as I love this cold weather, I still like to be toasty when I’m at home. There is a rule in our house – if the living room thermometer shows 14 degrees or less, something needs to be done quick sharpish or I’m likely to die* (*have a bit of a moan and turn the heating up). Living in an eleven room Victorian terrace, you can imagine it’s pretty hard to keep warm without incurring the gas bill of a small country. I remember reading in Bizarre Magazine about Kigurumi, Japanese animal PJs and, being a cute-a-holic, the idea appealed to me no end. 10 minutes Googling and I found many potential contenders but one company seemed to stand head and shoulders above the rest in terms of what they were offering. The All-In-One Company makes, among other things, adult sleep suits, designed, basically from scratch, by the customer, using a range of fabrics and add-ons. As you can see, I’m now the proud owner of a very fetching (?!) ‘onesie’ complete with tiger ears and a delightfully swishy tail. I could have opted for built in mittens and/or slippers and ever a drop waist (to save you from having to disrobe entirely for late night trips to the bathroom). I LOVE it. 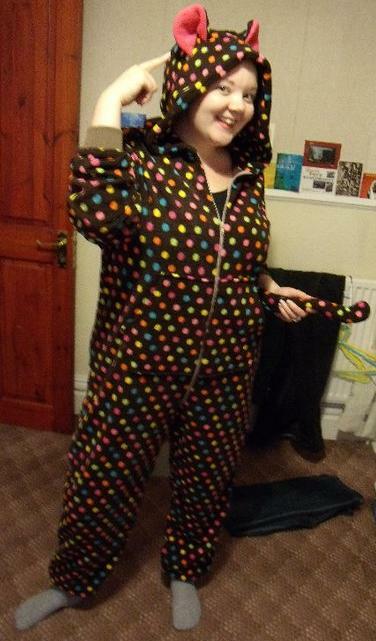 Yes, I look quite silly and yes, it’s not the sexiest thing in my wardrobe but I really don’t care. Worn over normal clothes, it almost entirely negates the need to have the central heating on, with only two of us in the house, it seems crazy to heat so many rooms that we’re hardly ever in. I think these would make amazing Christmas gifts and there is still time to get your orders in. I placed an order on a Sunday last month and it was delivered the following Thursday. Considering the sleepsuit was made to order, I feel that’s no mean feat. They’re super soft, incredibly warm, wash perfectly and, if you don’t take yourself too seriously, look fantastic. At £70+, these are no insignificant investment BUT I think we stand to get our money back through savings on the heating bill in no time at all. Oh, yes, I said ‘our’, didn’t I? That’s because my man also bought one. So please, don’t be surprised, if, when you knock at our door between now and April, it is answered by a 6ft 2 ladybird, complete with antenna.